Blue Monday, Little Green Men | Hey nerds! Ah, January. Part of me feels you get a bad rap, part of me feels your detractors are fully justified in their hatred. Today is unofficially known as ‘Blue Monday’, the flip to Black Friday’s intoxicating blend of impulse sale buys and retail-based violence; what that means is we’re all poor, we’re all housebound, and we can’t see the impending summer through the SAD-inflicting pitch blackness of 2015’s cold snap start and bare, bare trees. Heck, if you were to look at this very blog, you’d guess Blue Monday got an early start, such is the lazy fugue state I’ve been occupying since the bell tolled midnight on Jan 1st. Write for pleasure? Pfft, there’s boxsets and leftover chocolates to gorge on. Chance is I might have been confused as one of these Smurf wannabes in the past coupla weeks. But it’s not all bad. The Starks and co. would have you believe winter is coming (and that overblown fantasy saga happens to be back in April if that’s your bag o’ dragons) but the sun will shine on us once again. Case in point? On this very blue day, mere months after the Lynch legion were given an early Xmas prezzie in the shape of promised new ‘Twin Peaks’ episodes, Fox have confirmed they are intent on opening up ‘The X-Files’ once again. OMG!! 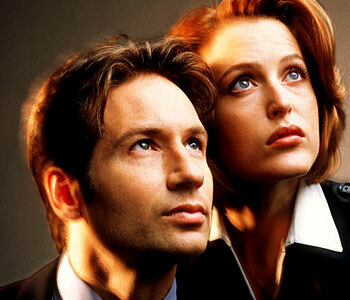 That stands for Oh My Gillian btw, seeing as this tentative announcement is not merely pointing to a rebooted recast remake, but has creative minds hoping for a reunion between Duchovny and Anderson as the original. Now, the second movie in 2008 was lacklustre – and, before we start seeking the truth that is out there all over again, remember this is still rumour mill stage – but this could be up there with new ‘Jurassic Park’ and aforementioned ‘Twin Peaks’ (still never seen ‘Star Wars’ so can’t comment there) as a nostalgia nuke to get excited about. Push the button, Chris Carter and TV-land people!